Your feet and ankles are very important parts of your body. They provide you with the necessary support to help you get through your day and perform all of your daily activities. If your ankle or feet are injured or are suffering from some sort of medical condition, it can reduce your mobility and not just pain, but a lot of inconveniences also. Fortunately, there are specialists that can help you with your feet and ankles. A podiatrist is a medical specialist who helps with medical conditions and injuries that affect your lower legs, feet and ankles. They diagnose and treat ankles, feet and related areas of your body. These specialists are trained in podiatric medicine to give them the knowledge and training they need to help you recover from infections, recover from injuries and help you with other medical conditions that affect your feet, ankles, and lower leg. Are podiatrists doctors and what kind of training do they have? Podiatrists do not attend medical school but they are doctors. After completing an undergraduate degree, they go through a 4-year program at a podiatry school to earn the designation DPM, which stands for Doctor of Podiatric Medicine. They study the injuries and illnesses that can affect the feet and related areas and learn how to diagnose and treat these issues, as well as how to perform surgery on the feet when necessary. After completing podiatry school they complete a 3 year residency, working in a hospital or other medical setting. Following their residency, podiatrists can obtain advanced certifications related to the feet and ankles. A podiatrist diagnoses, treats, rehabilitates and helps to prevent injuries and medical conditions that relate to the feet, ankles and lower limbs. They also work to correct and prevent deformities, treat infections, relieve pain, and keep you active and mobile. How can a podiatrist help me? You should consider seeing a podiatrist for treatment and advice if your feet are in pain, you have discolored or thickened toenails, cuts or cracks in your skin, certain growths like warts, peeling, scaling, or any other type of foot-related problems. Another thing that a podiatrist can do for you is recommended orthotics, which are custom-made arch supports, padding, and insoles that you place in your shoes to help relieve heel or arch pain. The orthotic device helps to increase the comfort of your shoes, take pressure off of any vulnerable areas, or re-align your foot. Even when your feet are in fairly good condition, you still may want to go see a podiatrist to have hard skin removed from your feet, to have your toenails clipped, to get advice on the proper footwear, or to simply ensure that you are properly looking after your feet. Podiatrists also can help you with more complicated foot problems. They can order x-rays and lab tests, prescribe drugs, reset broken bones, and perform surgery. Podiatrists also treat foot deformities, including clubfoot and other birth defects, along with other problems that are caused by damaged or neglect. There are also podiatrist specialists that can help you with specialised problems. There are podiatrists who specialise in sports medicine and treat ankle and foot injuries that are commonly sustained by athletes. Children are treated by pediatric care podiatrist, including children who have congenital foot defects. Surgical podiatrists use surgical techniques to remove bone spurs, perform ankle and foot reconstruction surgery following an injury, and other issues requiring surgery. What takes place during a consultation with a podiatrist? During a first consultation, your podiatrist will conduct a full medical history and perform basic tests, including examining your feet and checking your blood circulation. 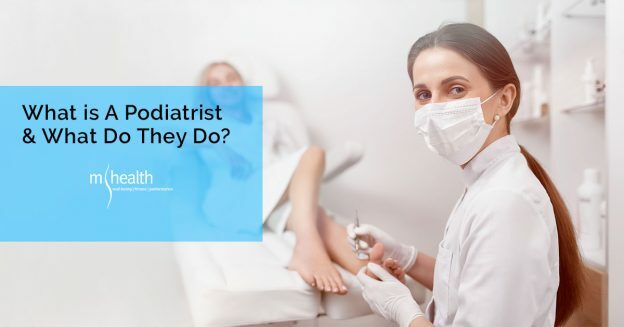 You and your podiatrist will discuss any concerns you have, and then he or she will make a diagnosis, prepare a treatment plan, and provide you with advice on how to properly care for your feet. Any minor problems can usually be treated right on the spot, including having calluses, corns, and hard skin removed. Usually, this session will be completely painless and last 30 to 60 minutes. Follow up visits may be required. Book your appointment today! Do I Need a Podiatrist? What is Podiatry? When Do You Need to See a Podiatrist? This entry was posted in Tips Physiotherapy & Osteopathy Melbourne on September 27, 2018 by MHEALTH.